Peace, many would agree, is a goal that democratic nations should strive to achieve. But is democracy, in fact, dependent on war to survive? 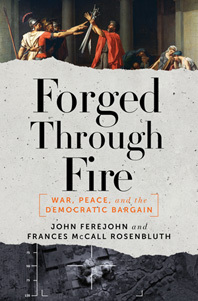 Having spent their celebrated careers exploring this provocative question, John Ferejohn and Frances McCall Rosenbluth trace the surprising ways in which governments have mobilized armies since antiquity, discovering that our modern form of democracy not only evolved in a brutally competitive environment but also quickly disintegrated when the powerful elite no longer needed their citizenry to defend against existential threats. Bringing to vivid life the major battles that shaped our current political landscape, the authors begin with the fierce warrior states of Athens and the Roman Republic. While these experiments in “mixed government” would serve as a basis for the bargain between politics and protection at the heart of modern democracy, Ferejohn and Rosenbluth brilliantly chronicle the generations of bloodshed that it would take for the world’s dominant states to hand over power to the people. In fact, for over a thousand years, even as medieval empires gave way to feudal Europe, the king still ruled. Not even the advancements of gunpowder—which decisively tipped the balance away from the cavalry-dominated militaries and in favor of mass armies—could threaten the reign of monarchs and “landed elites” of yore. The incredibly wealthy, however, were not well equipped to handle the massive labor classes produced by industrialization. As we learn, the Napoleonic Wars stoked genuine, bottom-up nationalism and pulled splintered societies back together as “commoners” stepped up to fight for their freedom. Soon after, Hitler and Stalin perfectly illustrated the military limitations of dictatorships, a style of governance that might be effective for mobilizing an army but not for winning a world war. This was a lesson quickly heeded by the American military, who would begin to reinforce their ranks with minorities in exchange for greater civil liberties at home. Like Francis Fukuyama and Jared Diamond’s most acclaimed works, Forged Through Fire concludes in the modern world, where the “tug of war” between the powerful and the powerless continues to play out in profound ways. Indeed, in the covert battlefields of today, drones have begun to erode the need for manpower, giving politicians even less incentive than before to listen to the demands of their constituency. With American democracy’s flanks now exposed, this urgent examination explores the conditions under which war has promoted one of the most cherished human inventions: a government of the people, by the people, for the people. The result promises to become one of the most important history books to emerge in our time.